Cornerstone investors have now been around for at least 15 years, yet very little has been written about them over that timespan, bar the odd academic study or short, factual articles on individual transactions published in the media. Despite a few attempts to introduce the concept to European markets, they are still essentially a phenomenon limited to three jurisdictions within Asia: Hong Kong, Malaysia, and Singapore. However, they have now become so essential to the success of initial public offerings (IPOs) that I thought now was perhaps an opportune time to explain in some detail who they are, as well as the process that is used to gather from them the equity bids that make or break new listings in these marketplaces. Cornerstone investors have now been around for at least 15 years, yet very little has been written about them over that timespan, bar the odd academic study or short, factual articles on individual transactions published in the media. Despite a few attempts to introduce the concept to European markets, they are still essentially a phenomenon limited to three jurisdictions within Asia: Hong Kong, Malaysia, and Singapore. However, they have now become so essential to the success of initial public offerings (IPOs) that I thought now was perhaps an opportune time to explain in some detail who they are, as well as the process that is used to gather from them the equity bids that make or break new listings in these marketplaces. Even though their geographical footprint remains limited, the influence they have today on global capital markets activity cannot be ignored, not least because Hong Kong has once again become the world’s most active exchange for new equity listings, and cornerstone investors now increasingly dominate demand for IPOs there. According to InvestHK, a government organization whose remit is to attract and retain foreign direct investment of strategic importance to the economic development of Hong Kong, in 2015, total equity funds raised through IPOs in this special administrative region (SAR) of China amounted to the equivalent of US$33.6 billion. The Stock Exchange of Hong Kong was not only the top stock exchange for IPOs for three consecutive years from 2009 to 2011, but also maintained a top five ranking in the global IPO market for the past decade, thanks almost exclusively to Chinese issuers. 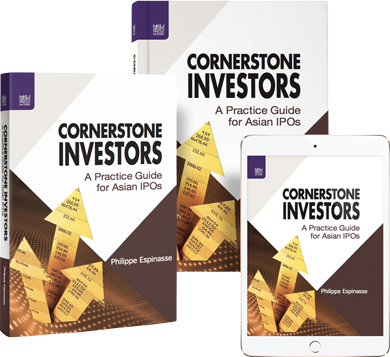 According to Reuters, between mid-2015 and mid-2016, cornerstones accounted for about 50 per cent or more of the deal proceeds for nine out of the top 10 IPOs in the territory, underscoring the growing influence of share sales to cornerstone investors in Hong Kong IPOs. The institutions and corporates who act as cornerstone investors come from a wide range of jurisdictions, from the United States to the United Kingdom, continental Europe, the Middle East, and Australasia, which makes them a truly global phenomenon, well beyond the limited scope of the three markets they have now pervaded. 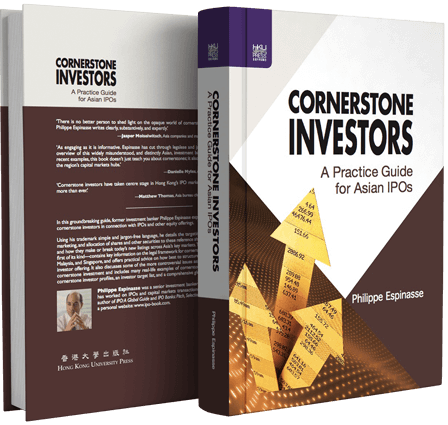 However, cornerstone investors now increasingly come from the Mainland of China, which is fast becoming unavoidable in the commercial and financial sphere, as it slowly, but surely opens up to the wider world. In a nutshell, cornerstone investors serve two functions: they de-risk equity transactions for both issuers and the underwriters and, because they are generally well-known stockholders, also encourage a wider pool of market participants to invest in new issues. In many instances, their presence (or, conversely, absence) can actually dictate the success or demise of IPOs. As with many aspects of new listings, there is often a lot of confusion about them, not just in the media, but also on the part of market participants, be they issuers, investment bankers or stock pickers. 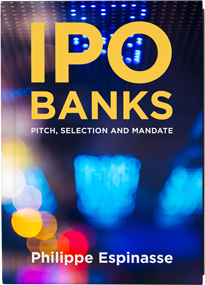 In this guide—the first of its kind—I have sought to clarify their role and how they come to subscribe in what are often (but not always) visible and prestigious equity offerings. Just like my other nonfiction books, this guide is purely a practical one. 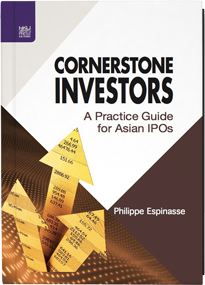 In these pages, the reader will not find any mathematical formulae, theoretical research or lengthy legal considerations, but instead clear explanations about the various types of cornerstones and the marketing and documentation processes that are used by investment banks and issuers to secure the commitments they make, across each of the markets in which they are found. Accordingly, I have included a wide variety of real-life examples, sample documents (such as a script for the initial approach to potential cornerstone investors, a non-disclosure agreement and a subscription agreement, all of which were actually used in past IPOs) as well as selected profiles for some 145 institutions and corporates, most of which have already subscribed for equity securities (shares, or units in real estate investment or business trusts), in a cornerstone investor capacity. Readers will also find an investor target list, a comprehensive glossary and an index to more easily navigate what can be a complex—and even at times daunting—subject. With any topic related to capital markets, rules and regulations—not to mention market practice—often change. So I would caution readers to seek legal or financial advice, where appropriate, having regard to their specific circumstances. 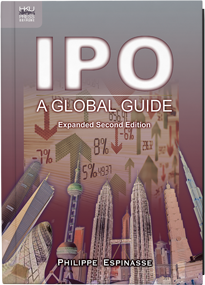 Information included in this book, while generally based on actual transactions, does not in any way convey investment, investment banking, corporate finance advisory, legal, accounting, tax or other regulatory advice of any kind, and no responsibility whatsoever will be accepted by the author or the publisher in this regard. It should not be relied upon, or used as a substitute for consultation with professional advisers. As ever, whether you are a prospective IPO candidate, an equity issuer, a capital markets professional, an investment banker, a private equity practitioner, an investor or a journalist, I am always keen to hear from you. Please do not hesitate to reach out to me through one of my websites. I hope you will enjoy this new book and that it will contribute to better understanding of the somewhat opaque, and certainly misunderstood, world of equity issuance in Asia—and beyond.